Iliasson, 16, (left) and his brother, Abdul Aziz, 14, haul their heifer, Blackie, in a donkey cart to their village in Niger. Blackie collapsed from starvation. 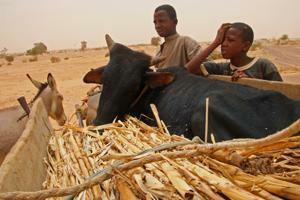 Nine of the boys’ 12 cattle have collapsed from starvation. They will hand-feed the animal a mixture of sorghum and millet husks in hopes of reviving her. Nigeriens ran out of food months ago, now the situation is desperate. Half of the people in this landlocked West African nation now don’t have enough to eat. People are eating leaves and livestock feed in order to survive. While hunger in Niger is nothing new, this year is particularly bad. Rains failed last year and in some areas, almost nothing was harvested. Nigeriens have been forced to sell off their livestock, basically their “savings”, before the animals die. In the face of this crisis, Caritas is distributing food, putting people to work and helping those in the greatest need. As cattle die and nutritional centres fill up with hungry and sick children, there’s no surer sign that the people of Niger desperately need your help. Read the story of how hunger has taken hold of the lives of Habsu Boubacar and her four children.